Infinity Bay Resort Condo West Bay Beach, Roatan, sans frais de service! Notre tarif journalier indique que nous payons les nouveaux 50 $. 00 par jour, une taxe de séjour déduite de nos bénéfices, et vous ne serez pas facturé. AVIS IMPORTANT: Le prix ne tient pas compte de la taxe de vente de 15% et de la taxe de tourisme de 4% que le complexe doit vous facturer, ainsi que des frais de nettoyage final de 46 $. 21 Les frais de service au moment du départ. Nous ne facturons pas ces frais. La station est tenue de charger et de percevoir. Cliquez sur le bouton Contacter le propriétaire pour vous informer sur les prix de vente et recevoir notre politique d'annulation. Notre magnifique condo est une unité au rez-de-chaussée. Il n'y a pas d'escaliers ou d'ascenseurs à attendre. À quelques secondes de marche de l'extrémité calme de la magnifique piscine à débordement de 300 pieds. *** Snorkeling fantastique juste en face du complexe. Unité au rez-de-chaussée / Accès facile, Aller-retour Navette aéroport / ferry gratuite, Service de ménage quotidien, Opération de plongée sur place, Cafetière, Grille-pain, Mixeur, Élimination des déchets, Serviettes de plage, Chaises de plage, Bath Sèche-cheveux, Concierge, Deuxième télévision en maître BR, eau potable saine, coffre-fort dans la chambre, bateau-taxi disponible directement à L-Dock. Infinity bay has a great location and this unit was perfect for us. Ground floor for easy access and right by the dive shop for easy planning. We really enjoyed our stay at Infinity Bay. The resort is very clean, well designed and spacious. The pool is lovely and the beach is beautiful. There are plenty of beds poolside and also on the beach, although to get one in the shade you'll need to be an early riser. The property we stayed in was amazing, very well equipped with modern appliances, and well maintained, we felt "at home" immediately. The resort's cleaning service came by daily which was a welcome surprise as we were under the impression this would be done just once a week. There's a small charge for this service but it's worth it. 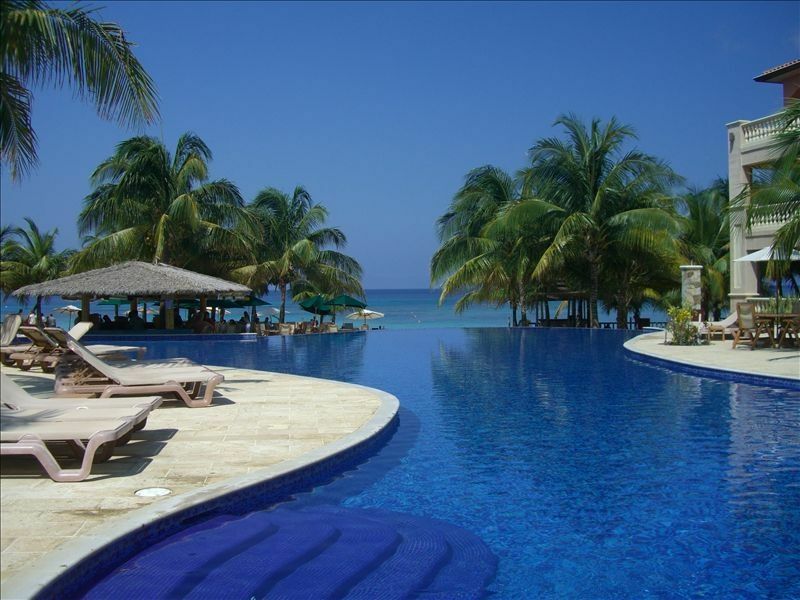 We would thoroughly recommend the resort, the apartment and the island of Roatan. We definitely hope to return. Thank you so much for your great review of our condo! We are so happy that your enjoyed your stay. You were wonderful guests and we we be so pleased if you would come back in the future for another stay! Beautiful island, beautiful beach, and a very nice condo. This was our first time visiting Roatan and we chose a lovely place to stay. The snorkeling is the best. There are amazing fish to see just snorkeling from the beach. The islanders are very gracious and friendly, and the hotel staff is very helpful. We had plenty of room in the condo in a nice setting. The pool is delightful. I would have given it five stars if the kitchen were better equipped. We like to have breakfast and lunch in and then go out for dinner. While there were decent pots and pans and dishes, the knives, can opener, and storage containers could be replaced. Overall, we had a lovely stay and will come again. Thank you. Thank you for your nice review of your stay. I am glad that the front desk helped you with items you were not able to find when you first arrived. Our Owners Relations Manager privately wrote me and said " I'm glad it got resolved right away, the guest came by to front desk returning the extra supplies as she found the ones that were already in your condo." So I am happy with the results of our wonderful staff. Please come back and be our guests anytime! Great vacation. We will be back. Condo is pretty much as advertised. It’s located on quiet end of resort but only a few steps to pool or beach. We had a teenager sleeping on the sofa bed which was comfortable compared to most sleepers. You’re limited to eating at breakfast bar or on patio but that only has 2 chairs (I’m sure resort would have brought another chair if we had asked). Master bed mattress very firm and took a while to get used to. Kitchen is equipped for smaller meals. Only a few steak knives and no cutting board so cutting fruit was a challenge. No oven mit or kitchen towels so using the oven would be a challenge. Of having any dish towels meant we had to run dishwasher almost daily to have enough silverware and dishes. We only used kitchen for brunch meals. Having daily maid service was very nice, it’s pretty much like a hotel. The resort is very nice and staff are excellent. The beach chairs on beach get taken early during peak days (we were there for Xmas) but we had no problem getting 3 as long as we got there by 8am. After the peak days it was easy getting chairs. There are 2 kayaks which we used daily, they are rarely in use. Infinity Divers is onsite and were excelent, we tried diving for first time. Highly recommended. West Bay beach is about 0.5 miles long and very nice. We felt safe no matter the time of day or night. Snorkeling off the beach if amazing. You can literally swim 50 yards from the beach and you’re in the middle of the reef. If you have small children or a little cautious swimming I would recommend start snorkeling by the wall on he left side of beach. It’s sheltered and you will see a ton of fish without venturing far. Key an eye on the wall because it’s full of Igana poking their heads out of the holes in the rocks. My favorite place to snorkel was just beyond the reef outside IB where the water gets deeper (30’), just look for where all the dive and snorkel boats go. In fact this was better than the snorkeling we paid for on an excursion to th east side. Food at all the restaurants on West Bay was very good with exception of Infinity Bay which was very average and more expensive. Our favorites were Beacher’s, Argentinian Grill and Sunset Hideaway. We took Honduras Lempira, US$ and a CC. Everywhere takes US$ and gives you a very good exchange rate so don’t need local currency. Dive shops an excursion tours will not charge tax for cash so save the CC for meals and use cash for the bigger purchases. The condo was a perfect size for two. Located at the back of the property, it was quietly located away from the pool and beach. However a short stroll to the fun. The resort was clean and the landscaping was beautiful. Prices at restaurants and bars were reasonable. Water was wonderfully clean.Snorkeling right off the beach was good. Be aware taxes are collected at the resort (19%) as well as a cleaning fee (about $40 and well worth it). The only negative was the kitchen was not well equipped to cook. All in all a wonderful vacation and one we hope to do again! Thank you for giving us a five star review. We are very happy that you enjoyed your stay in our condo. Also, thank you for returning my to verify what your review meant when you said our condo was not well equipped to cook. I am very happy to hear that you were only referring to "not having a serving tray to take food and beverages to the pool area". We do ask all guest to not take things such as plates and glasses out of our condo and down to the pool or beach. Our condo is fully equipped to cook in, as we live in our condo when we are at the resort, and we do share all of our things with our guests. Also, all guests are always informed before booking of all fees and taxes, so no need to 'be aware"
So, to any potential guest reading this review, just a little heads up regarding some of Johns comments, they loved their stay in our condo, and please know that we request you do not take any of our personal items out of our condo to the pool or beach. Thanks again for your review John, and I am glad you would like to return again sometime in the future. This was a great place for the two of us to spend our anniversary. The things we liked about the condo were: Full kitchen, TVs with cable, large bed, 1st floor easy access, porch with fan facing the common area, away from noisy pool area, low traffic area, A/C was cold. The overall property was great too; we liked: Large pool w/swim-up bar, activities coordinator (Esmeralda) very helpful, friendly staff, good food, daily room service, dive shop on site, excellent beach area. Hands down, the best beach access to reef snorkeling I have seen. Walk into the water and swim 40 yards out to see some really great reef and sea life. Lastly, the owner was extremely responsive and helpful. Thanks for the great review! We love to hear from guests that enjoy our condo and Infinity Bay Resort as much as we do! Come back anytime for another visit! World Class plongée et snorkeling, Nuit Dives et Nuit Snorkeling, à fond de verre en bateau, Dolphin Encounter, tyrolienne, Iguana ferme, des jardins botaniques, Crystal Clear eaux calmes, ferme aux papillons, Island Tours, Tours en bateau d'îles inhabitées, Visitez les Garifuna gens, Profitez Location de scooters et une cuisine internationale,. An additional 19% Honduran tax is due to the resort at time of check in by cash or credit card. We do not charge this or collect this fee. The resort collects this fee for the Honduran government. Holiday rates apply for Fishing Tournament week (Sept), Thanksgiving, Christmas/New Years Week & Semana Santa/Easter Week, and July 4th week. Please contact me for rates and cancellation policy. Rates are based on 2 adults, and two children under 10, Or only total 3 adults. Until payment is made in full and confirmed , Rates and availability are subject to change.